Noma Australia, without doubt the most detailed, involvedly scrutinized, and adventurous restaurant ever to open in Australia. Much has previously been said about the $485 expense label (food only), that all 5500 seats vended in 90 seconds, that 27,000 stay waitlisted. Finally the ‘D’ day arrived for my rock star moment at Noma Australia. Then it happens… As I entered a familiar face appeared in front of me, I was greeted by Chef Rene Redzepi (himself) and his team and it took me a few minutes to gather myself, to be honest I was literally star struck which was obvious for anyone who knows what a talented chef Rene is. I have been to Copenhagen but this was my first opportunity to actually see him in person! On offer is a wine or a juice paring, I went in for the latter. My meal began with an ‘unripe macadamia and spanner crab’, a sharp and delicious broth bathing with crisp thin slices of the nut with a dash of rose oil. Next came the gorgeous looking tart bowl of native berries; lilly pillies, muntries, Kakadu plum quite like an appetite cleanser, followed by wattle seed wrapped in saltbush. Unbelievable and path breaking…delectable too! I had to pinch myself as Rene walked towards my table carrying bowls of shells. ‘This is what we call the ‘Seafood Platter’,’ he says with the most innocent of smiles. ‘Here we have five types of shellfish, covered with the skin from chicken broth, and crocodile fat.’ He also shared that the crocodile fat comes from a farm where the crocs are fed only chicken…and then he heads back to the kitchen leaving us to enjoy the stunning and inexpressibly enjoyable platter of cold shellfish including pippie, mussel, strawberry clam, cockle, oyster capped with a fatty, secret sliver that is in one simple word just ‘wow’. 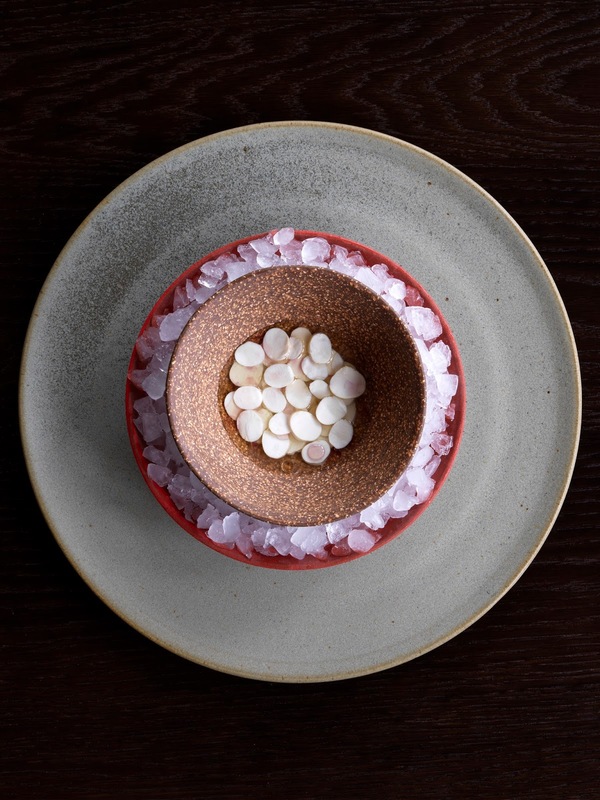 Redzepi is fixated most on fetching out new flavours from ingredients we’ve forgotten, markdown as weird, or reflect so ordinary they seem unfit of a tasting menu, anywhere he finds them. It isn’t a wonder why the inventive Noma, in Copenhagen, has four times been baptized world’s best restaurant, and that Redzepi has been at the frontline of universal notice in Nordic fare and foraging. For the Barangaroo pop-up he and his team of chefs have weathered the zone meeting people from the cities and the bush for home-grown ingredients running the gamut from snow crab plucked from 1000m beneath sea level off the coast of Albany, to magpie goose shot in a distant Aboriginal community outside Darwin. The outcome is a 12-course menu which is a masterpiece, a menu in which each course works musically with the next, all the senses clank and are soothed, the memory is heaved as challenging ingredients are wrought into imaginative offerings. The vigour and assurance is exactly the same as Noma, Copenhagen, the produce range and visual of the place is like stepping into a new restaurant. The sweet-smelling Albany crab with egg and fermented kangaroo juice clues at scrambled egg. The wattle seed saltbush parcels are a nod to multiculturalism via a play on dolmades. What have been twisted are flawless mergers of the rare and the usual. It is ingenious but the brilliances are genuine. Indeed, as you banquet in a chamber where the chef himself attends you, where staff is consistently excellent, where the juice is as exciting as the wine, the food wild, it is narrowly imaginable not to accomplish a sense of delight at experiencing a master at work. Where did you visit on your research trips? We started out in New South Wales, thoroughly traveling through the state. Then we went around Tasmania and into Victoria, where we drove around visiting farms for three days. Then we went to South Australia, and spent a lot of time in the Adelaide hills and in Flinders’ Range. From there we went to Queensland, traveling the coasts for tropical fruit and crab, before flying to Darwin where we had incredible trips to Gove, Arnhem Land, and Tiwi Islands. Last But not least we went to Western Australia, foraged on the beaches, and went on a fishing Boat in Albany. · Noma Australia at Barangaroo, Sydney disclosed the menu for the sold--‐out ten-week residency on the 26th January 2016 and was open till April 2, 2016 . The restaurant, a partnership amongst Noma, Tourism Australia and Lendlease, Showcases some of Australia’s superlative and most remarkable produce with a strong emphasis on coastal Ingredients. · René Redzepi, one of the world’s renowned and most esteemed chefs, and his Noma Team; have spent the last twelve months nomadic to every corner of Australia, taking In all states and territories, learning about innate ingredients, local wines and cooking Methods.